The Global Tiger Centre Does It Again! Greetings for the Earth Female Pig Year! On February 5, Bhutan celebrated its lunar new year with a two-day national holiday. Families all over the country began the day with offerings and prayers for another year of peace and prosperity. Here at the Bhutan Foundation, we continue to mindfully support our Gross National Happiness (GNH)-inspired communities and foster great relationships with our partners on the ground. In that vein, we are happy to share some updates from our recent trip to southeastern Bhutan as we kick off yet another exciting year! Last month, we accompanied a group of farmers from Marangdut village in Panbang, located near the Royal Manas National Park in southeastern Bhutan on a trip to Dewathang in the Samdrup Jongkhar district in Eastern Bhutan. The district is home to the Samdrup Jongkhar Initiative (SJI), one of our partners promoting sustainable communities through organic farming. The farmers’ group was provided with hands-on training in organic farming techniques, including methods to make organic fertilizers from cow dung, bio-pest control solutions, soil nutrient management, seed treatment and saving methods, and bio gas production from cow dung to meet individual household energy needs. We are excited and hopeful about the positive impact from community-level exchanges of knowledge and best practices. The farmers’ group was comprised of 19 farmers representing 17 out of 22 households (and 105 people). Out of that group, 11 were youth, who have studied up to grade 12 and have chosen farming and village life over uncertain city dreams. In fact, the village representative, Mr. Tandin Wangchuk, 33, was also part of the group and is a university graduate. Tandin is now taking the lead to create a sustainable community in Marangdut village. Speaking of Marangdut, we cannot forget the River Guides of Panbang, who are located in their secluded backyard, just a few hundred meters away! The River Guides of Panbang are taking a leadership role in helping these farmers create a sustainable community. Over the years, the River Guides of Panbang (RGP) has managed to show what true community- based eco-tourism can be. RGP has attracted hundreds of visitors to the once-secluded community, showcasing its unique culture and rich biodiversity while generating new economic opportunities for the locals. Today, RGP not only boasts having Bhutan’s first female kayaker as part of their growing team, but also trained four additional local youth as safety kayakers, including another young woman who has completed grade 10. To cater to increasing visitors, RGP has expanded its bed capacity from this season and has hired additional local youth for upscale hospitality services at the Jungle Lodge. From the Jungle Lodge, the Royal Manas National Park’s rangers’ office is just a 30-minute drive away, so we stopped there to meet Bhutan’s Global Tiger Centre team. The Global Tiger Centre (GTC) team continues its ground-breaking work in understanding tiger behavior and movement. 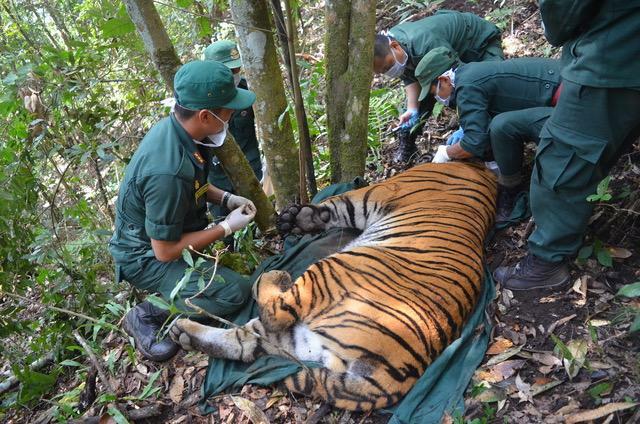 In addition to the first female tiger (named Tendrel Zangmo) that was radio-collared in Bhutan last February, the team has successfully radio-collared the first male tiger (named Singye Dradrok) in the same sub-tropical range this past December. 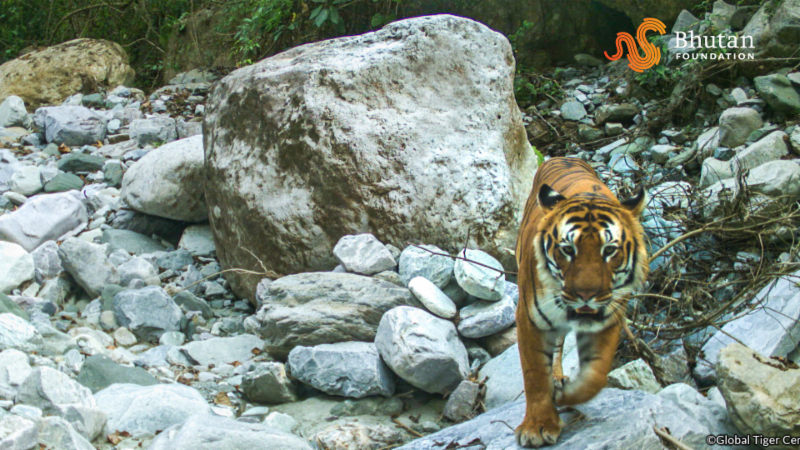 Since then, the data from these tigers have been providing unprecedented insight into Bhutan’s tiger movement ecology. During our visit with the team, GTC’s leading tiger biologist, Dr. Tshering Tempa, simulating the data feed on his laptop, turns around to us with a beaming smile and says, “I think Tendrel Zangmo has given birth!” It is risky to approach the location to confirm this theory yet, but hopes are high that the team will soon know for certain. This year, the GTC team will move up north to the mountains to radio-collar more tigers in order to better understand the apex predator, whose survival ensures that many species live and flourish throughout Bhutan’s forests. The team will spend weeks and months in the unforgiving jungles to understand and safeguard the beautiful cat. It is always humbling and inspiring for us to spend time in the field. We hope you will continue to support us to enable harmonious coexistence of humans and animals in our GNH-inspired communities. 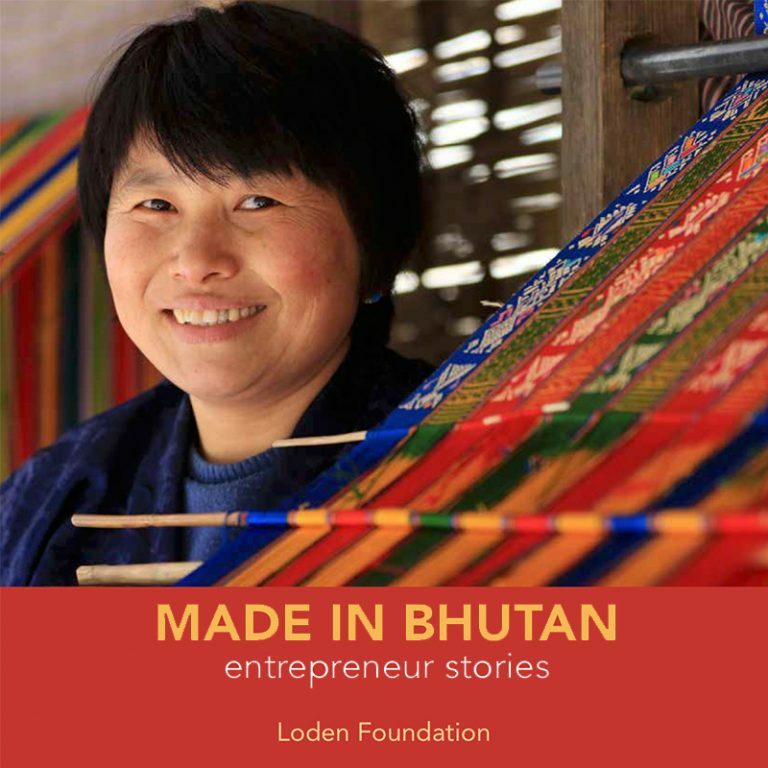 Made in Bhutan: entrepreneur stories is a celebration of the 10th anniversary of the Loden Entrepreneurship Programme (LEP). 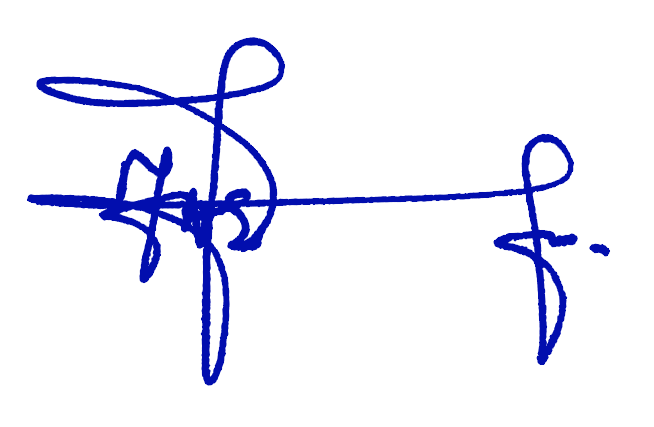 LEP has trained about 3,180 young people and contributed to the creation of over 700 jobs through funding 153 entrepreneurial ventures. The projects are spread across 18 of the 20 districts of Bhutan. 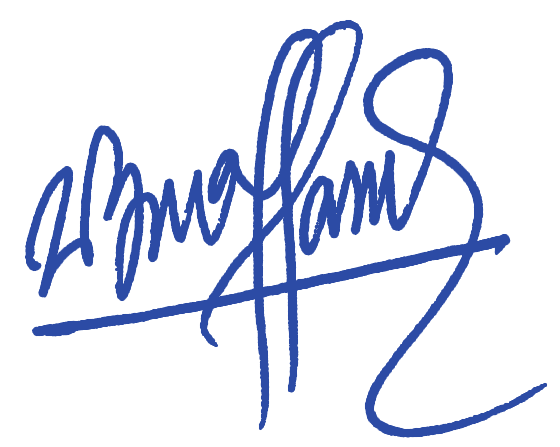 Beyond financing, Loden provides mentoring and networking to help young entrepreneurs who are facing unforeseen challenges. Made in Bhutan is scheduled to be completed by October 2018. Hurry and reserve your copy now! 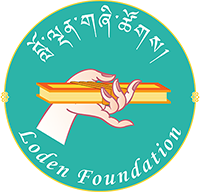 Contact Mr. Phuntsho Namgay at pnamgay@loden.org .